I was recently demonstrating Questionmark Live to one of our customers and he was telling me about the “Data Wrangler” job in animated movies. Basically the person’s job is to collect all the work from the animators. 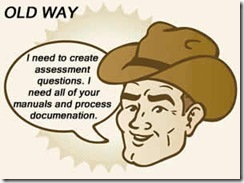 So all of you Instructional Designers now have a new role to add to your resume…SME Wrangler. It might actually be one of your more taxing and complicated duties. 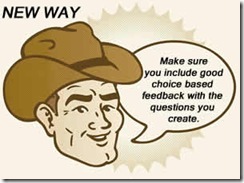 The ELearning Guild recently held an online forum titled “To SME or Not to SME: Tips for Working with your Customer and your Team.” I loved the title, but I think “How to be a Good SME Wrangler” has a little more bite. As learning professionals we have to wear many different hats and foster different relationships. The relationship you have with your SMEs can often make or break your training program. One of the presentations touched on seven tools of the trade for working successfully with SMEs. The number one item on the list was resources. They mainly discussed having a well thought out design document and project plan, but I immediately thought about Questionmark Live. What better way to establish a relationship with the experts in your company than to give them a tool that not only empowers them to transfer their knowledge but also immediately involves them in creating deliverables that will be used by their peers? Make sure that when you take a look at Questionmark Live you think of your role as a SME Wrangler and how this tool could help you foster a successful relationship with your SMEs.